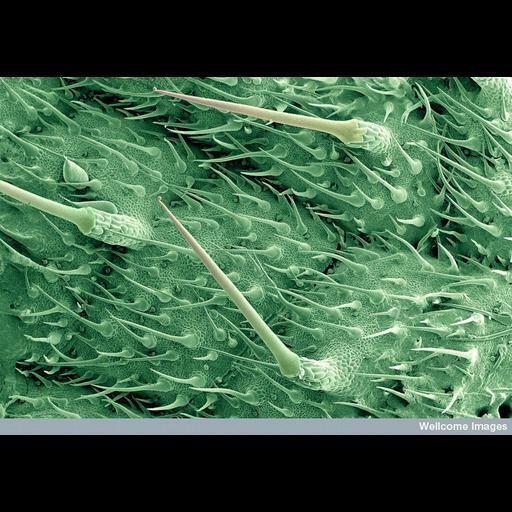 Scanning electron micrograph of stinging hairs on the surface of a nettle leaf. The large stinging hairs (trichomes) are hollow tubes with walls of silica making them into tiny glass needles. The bulb at the base of each hair contains the stinging liquid that includes formic acid, histamine, acetylcholine and 5- hydroxytryptamine (serotonin). The tips of the glassy hairs are very easily broken when brushed, leaving a sharp point, which easily pierces the skin to deliver the sting.